Thanks to RaspberryPi.org for flagging the work of Gadget Nut, who is definitely a Gadet Master, too. 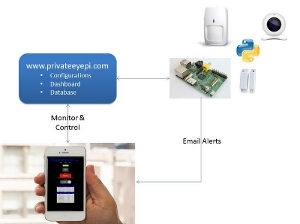 They have been working on the PrivateEyePi project, building a DIY Home alarm system. It is modestly described as a simple system that can link to existing door contacts or alarm sensors, and there is also a Web server to feed your own remotely accessible personal dashboard, which is designed for mobile devices. 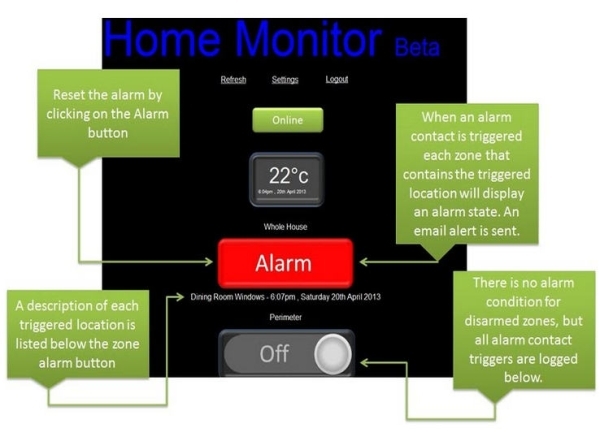 You can use this dashboard to control “alarm system zones”, and view alerts or activity logs (for example times and dates of when a back door has been opened). You can even configure your Pi to send email alerts, if you so wish. Basic low voltage electronic skills. We will provide you with a full inventory of electronic parts and diagrams. We will show you bread board wiring schematics for you to copy. Basic Raspberry Pi and Linux experience. Even complete beginners with no programming, operating system or electronics experience can make this work. You can also use our blog to ask questions or email our support email.